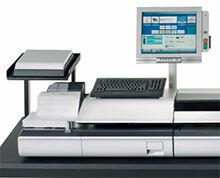 The IS-6000 has set a new standard for mailing system productivity, operability and efficiency. Neopost observed high-volume mailing machine operators and listened to high-volume mail customers before designing it. The IS-6000 has been designed with the operator in mind. At first glance, you will notice all mailing operations are controlled from the same area, creating the ideal ergonomic workspace. This system’s modular and flexible design allows operators to adjust and place components within arm’s reach, minimizing the range of motion, ensuring optimal work-flow and comfort. All screens feature large descriptive buttons and prompts, making navigation a breeze. Operators can create rate shortcuts and favourites for rates, as well as customized menu keys, all on the home screen. The added comfort of a full keyboard facilitates setting up an account or department and usage. A dedicated workspace under the screen provides an additional area for sorting and preparing mail. New ink and printing technology provides maximum return on your investment. Say good bye to the additional consumable costs of print heads. Every IS comes standard with a permanent print head designed to last the life of the mailing system. Meeting the demands of your mail processing centre can be tough. Whether you are working to time-critical deadlines or your daily routine has been altered, the bottom line is the work has to be done. You need a durable and reliable workhorse that is going to deliver. High capacity envelope feeder with reload on-the-fly capability. True mixed mail feeding that eliminates pre-sorting. Three speed choices up to 210, 260 or 300 lpm. Dynamic scale that rapidly weighs and measures mail in-line. A power conveyor stacker with a storage capacity ratio in synch with the feede.